Suzie, I just Love all your patterns. 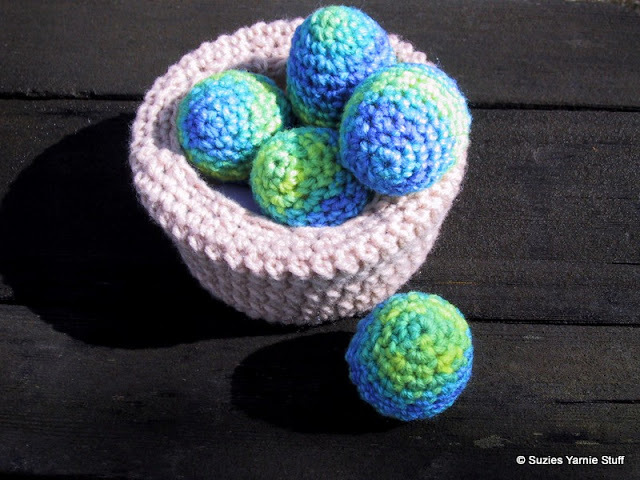 I have a question: Do you have the pattern for the basket that is holding all your beautiful covered eggs? I've made all the eggs, and i really like that particular basket you show holding the eggs. That basket is my Easter basket, the link in under Holiday Stuff on the right side of the blog. It is the one made to cover a Cool Whip container. It never got embellished, maybe one of these days. But I'm having too much fun covering eggs. WOW--Thanks Suzie for your quick responce. I will be getting more yarn together and start that basket tomorrow for sure. Love the eggs, Suzie!! Just want you to take a peek at my blog when you get the chance to. I have come up with a few neat things using your shamrock pattern!! I hope you like them!